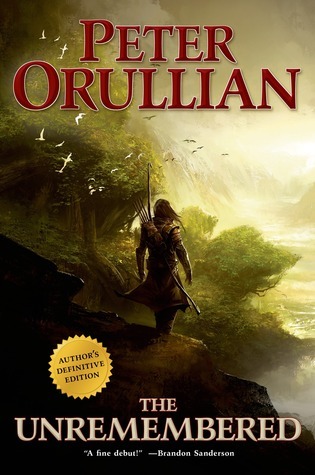 This month's Fantasy Review is Peter Orullian's The Unremembered—the Author's Definitive Edition. There will be slight spoilers below. Tahn is a young man who lives the Hallows, an area full of farmers. He and his sister and friends are taken by Vendanj, a warrior of the Order of Sheason, and Mira, a member of the Far, to Tillinghast to try and stop the weakening of the Veil—a barrier that keeps the Quiet away from the world of men. Along the journey, each of the group's members discover their secret talents, and better understand why they were chosen for this quest. Most of all, it's Tahn who's needed, because of his special gift to understand the Will—he cannot shoot his bow unless the Will allows him too. However, that inability to choose who must live and who must die only adds to the burden he already bears. Tahn's unremembered past may be the biggest burden of them all. The characters are what make this story come alive. Each one is well-rounded, with equal flaws and strengths. I think the easiest way to talk about the story it to highlight each character. Tahn—the protagonist—strikes me as such an interesting character, mostly for his flaws. In the very beginning of the story, I love that he was unable to shoot the Bar'dyn, a monster that threatened his sister and her newborn child. I think it sets a tone for his character through the novel, that there is some doubt in the reader's mind about his abilities. Did he really refrain from shooting because of the Will? Or is there something deeper inside him, a bit of fear and cowardice? And as the journey progresses, he seems to make more mistakes, and one of those mistakes can mean the difference between him being the hero and being killed. Wendra—Tahn's sister—is introduced to the reader in a time of fear and weakness, as a Bar'dyn is trying to steal her stillborn child. Because of this, it seems she grows the most throughout the story. When the group gets separated, and she takes a motherly role to Penit, she matures and finds her inner strength. She goes through more danger than the others, and makes it through with her own cleverness and determination. Along the journey, she discovers she has the power of song inside her, and that Vendanj meant her to train as a Maesteri. But her love for Penit made her continue the quest instead of studying. Penit is a young boy who was abandoned by his family of traveling performers. He's taken in by Vendanj's group for unknown reasons. Quick witted and clever, the boy's skill as a performer acts as a sort of comic relief for the characters. He's sweet, and cared for by Wendra—but it seems like he has nothing but misery in store for his future. Mira is a lovely woman of the Far, an elf-like race that is doomed to short life spans. She sets out on this journey accompanying Vendanj and his rag-tag group, but is summoned home when her sister dies. She and Tahn have chemistry between them, but the Far race is doomed to a short lifespan, and she knows there can be no future with Tahn. This shadows her judgment, and she makes hard decisions—decisions with Tahn in mind rather than her people. The Far race is particularly interesting as they guard the old Language, and that may be the key to everything. Vendanj is a Sheason, a member of a warrior guild that is dedicated to protecting humanity. They are able to access the Will—the magical force within the world. Vendanj's mission is to find a person who can Render the Will and defeat the evil growing at Tillinghast. As the journey with Tahn and his friends goes on, we see that this is not Vendanj's first attempt at this quest. He is also haunted by a tragic past. He serves at a guide and mentor to Tahn—who struggles with bending to the decisions of the Will. Though quiet and aloof with the others, he is a dedicated man who will stop at nothing to see his mission successful. The learning curve for this story is very high. There's a ton of in-world terminology that is discussed but not explained. This can make it difficult to stay focused, or to remember what exactly all the words mean. There is a handy glossary in the back of the book with detailed entries on most of the in-world terms, but it's still tricky to go back and forth between the novel and the glossary so much at the beginning of the story. The narrative also starts with the group already on route to Tillinghast, and much of how they got there is revealed later. While this is a great way to get to the action immediately, the reader is left wondering how the group all came together. Of course, patience pays off, and everything is recounted—but it can be difficult to hold off on getting answers right away. This book was a wonderful read, and the start of what seems to be an exciting series. The characters are very realistic with the way they handle the pressures thrust upon them, and their actions and motivations go hand-in-hand. The multiple magic systems also piqued my curiosity, and I understand they will be explored more thoroughly in the next book—Trial of Intentions, which will be released May 26, 2015. Tahn is definitely a flawed hero, and that makes his decisions in the story heavily weighed—he makes selfish decisions that cost lives. I'm looking forward to the next book, and to what the future has in store for Tahn and the rest of his group. This book is available at Dragonmount's eBook store here. When it is released, you can also purchase Trial of Intentions here. You can also look at a Dragonmount exclusive interview with Mr. Orullian here.